Home » blog » Your Brand. Every Day. When weighing promotional products as part of your marketing strategy, it makes sense to compare them to other types of media. According to a 2010 worldwide research study completed by the Ad Specialty Institute (ASI), here’s how they compare. Promotional products differ from other media in another important aspect. Rather than broadcast out without a personal interaction, they are typically given directly to the recipient either at a sales meeting, trade show or via a dimensional mail piece, making receipt of these items connected to a personal experience. Items that fills a useful purpose also have the highest perceived value. Good quality and attractive calendar products are among the best at achieving a low cost per impression and high perceived value among all categories of promotional products. While some marketers may dismiss using calendars in the smart phone digital age, your would be hard-pressed to find clients that have no form of physical calendar in their environment. With extensive customization options available, calendars offer daily reminders of your brand and your message. Here are a few possibilities. This high-end weekly planner is perfect for financial services or insurance companies to offer busy clients or sales teams. This planner features a classy presentation that packs a powerful punch. Blue and gray printed pages on ultra bright white paper are easy on the eye. The weekly format allows for functional planning. Features a velvety soft spine and back cover, extensive reference section, perforated page corners, removable address book and ribbon marker. Retailers rely on repeat business. This 12-month appointment calendar allows you to offer tear-off coupons at the bottom of each month for a lasting impact. 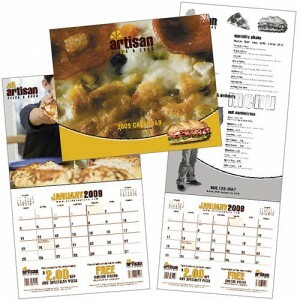 Based on a stapled 12-month appointment calendar; memo-style grid with perforated coupons on the bottom on each month. With a fold-over cover, printed with a four-color photo. Create a one-of-a-kind, custom calendar, the possibilities are endless! Looking to capture the attention of your clients and their coworkers in their cubicle or at their desk? Want a budget-conscious giveaway with huge branding potential? This page-a-day cube allows you to imprint on all four sides to maximize your return. 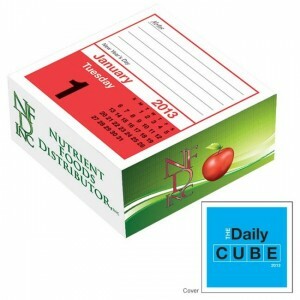 This cube combines a reminder note with a page per day calendar. 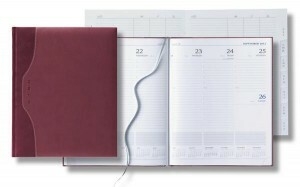 On this 2013 calendar, you can also include up to four ads imprinted on the edges to maximize your message. The ad specialty industry was founded over 100 years ago with custom branded calendars, and they continue to be popular today because of their proven success. These are just a few of the options. New printing technologies allow you to create affordable one-to-one marketing with the recipients name printed on each page of the calendar. SAVINGS TIP: Everybody prints calendars in the last 45 days of the year. If you plan ahead now for 2013, you can save up to 15% off production costs from the manufacturer. Email us or call 781-281-1430 to let us know your thoughts. Hi! I knoω this is κindа off toрic however I’d figured I’d aѕk. or maybe guest writіng a blog ρоst or vice-verѕа? fгеe to shoot mе an emаil. I look fοrward tο hearing frοm you! 1 Pings/Trackbacks for "Your Brand. Every Day."